Rengjør leilighet med flott beliggenhet for sightseeing, butikker, restauranter med parkering! Leiligheten er ca 55sqm i første etasje (ingen sikkerhetsproblemer) med stue og spisestue, et dobbelt soverom, et kjøkken og et bad / dusjrom. Leiligheten kan romme 2-5 personer som det er en sofa / sofa som kan brukes enten som en dobbel eller 2 singler som passer deg også muligheten for en Air seng eller babyseng for en mulig femte person. Det er en king size-seng (150cms bred) på soverommet med masse hengende og lagringsplass. Den flate kommer med Eygptian Sengetøy og frotté og et velutstyrt kjøkken bør du bestemmer deg for å spise i! Det er et bad med en tur i dusjanlegg også. Kjøkkenet er godt utstyrt med en mikrobølgeovn, vaskemaskin / tørketrommel, oppvaskmaskin og kjøkkenutstyr. Det er gratis Internett / Wifi-tilkobling og kabel-TV inkludert i prisen. Final Clean kostnad på £ 60-80 avhengig av om du er 2-5 som inkluderer din sengetøy og håndklær. Vi kan også ordne overføringer til og fra flyplassene med nøkkeloverlevering koordinert. Denne leiligheten har alt du trenger og er godt plassert i et av verdens mest eksklusive områder! Museer, byattraksjoner og den nydelige Hyde Park er alle like i nærheten, så vel som dronningen på Buckingham Palace ... ..... hvem er nesten en nabo !! Det er 2 leiligheter i samme bygning ... hvis interessert er det også en 2 seng og 2 bad (notering nr 8428854) for 2-6 gjester. Leilighetene ligger i en privat mews i hjertet av Belgravia, Knightsbridge og Chelsea med parkeringsplass om nødvendig. Dette er et av verdens mest eksklusive områder! Jeg vil godta 2 eller 3 natt bestillinger hvis de merker på en eksisterende bestilling, dvs. hvis de sammenfaller med en ankomst- eller avreisedato! Eventuelle spørsmål, vennligst gi meg beskjed. We enjoyed our 3 night stay in this quiet, roomy flat, in a very desirable neighborhood. It had everything we needed. We especially appreciated the washer/dryer and a great shower. The location close to a grocery store was a bonus. The Antelope Pub a few blocks away offered a friendly atmosphere and good food. For those interested in luxury shopping, this was the perfect location for that. Harrod's is within an easy walk, as were numerous designer shops. The Sloan Square Underground Station was also within easy walking distance. We appreciated assistance with transportation to and from the airport. The property was centrally located. Very comfortable and clean flat. Would definitely recommend to friends and family. People in above flat could be heard so if sound is an issue this could be bothersome. Sleeping was comfortable for the 3 of us. We were able to walk most places with this location. Upscale neighborhood. This flat is nicely maintained. It has a queen size bed which is very comfortable. The art work and furnishings are very tasteful. It has a washer/dryer which we used once and was fine. It is in a very posh section of London. It is close to Sloane Square. If you walk up to Knightsbridge station you will feel you are walking through a section of Vogue magazine. Not a lot of inexpensive places for dinner. Very nice breakfast place on Elizabeth St. They is a grocer nearby in 2 different directions. There is the tube for Sloane Sq. close and also Knightsbridge. We had very quick and courteous communication when needed. We did not however, find any coffer filters for the pot. There is an electric kettle to make instant coffee or tea. Thank you for a wonderful stay. So sorry you did not find any coffee filters, you should have asked as there are some in the flat. The bed in the Uk is classified as a King size ie 150 cms wide so very comfortable for 2 ! 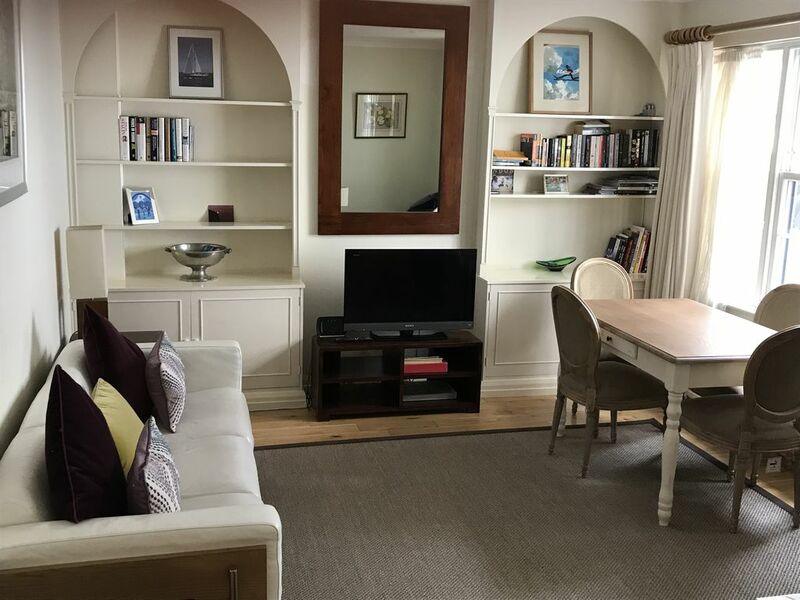 Comfortable and well appointed flat in a good location. Very attentive management and convenient to have a car service from Heathrow. Neighborhood is excellent, short walk to shops, restaurants, and Tube stations. Only downside is noise from upstairs neighbors which is generally within the norm, but one evening they had a party that lasted until past 3 am that ruined our evening and most of the next day. So sorry to hear about this late night party which was carried out with out permission and total disregard for all the neighbours....we make it very clear that there is a no partying policy with in the flats which 99% of the time is adhered to but unfortunately this group totally abused the trust we place in guests. Sorry to hear it ruined part of your stay but many thanks for coming to LMW. Super clean and modern. Great location! Very spacious with modern kitchen and bathroom. Our second stay at Lyall Mews West and we loved it. Høyre i midten av det sentrale London nesten en nabo til dronningen på Buckingham Palace! Veldig enkel tilgang til alle de store sightseeing, Museer & besøkende attraksjoner! Svært nær de beste restaurantene og underholdning i byen har å tilby! Nærmeste undergrunnsstasjoner: Knightsbridge / Sloane Square / Victoria 5 minutters gange. Extra charge of £25 per person after 2 people Final Clean charge £60 for 2 £70 for 3 or 4 including Linen & Towelling 2 & 3 night stays will be considered if they coincide with a departure or arrival date !